Crossover phenomena due to thermal composition fluctuations play a multifarious role in polymer blends. This is demonstrated in this article by describing results from small angle scattering experiments in particular with neutrons. Scattering methods are a direct tool to measure the strength and correlation length of composition fluctuations. 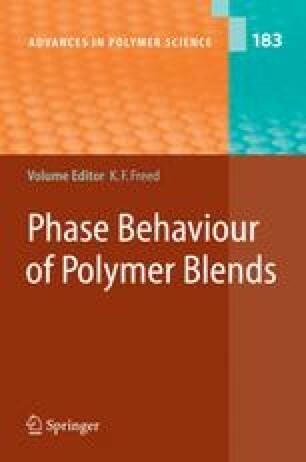 We will review the effects of thermal fluctuations in binary (A/B) polymer blends under various conditions of external temperatures and pressures and additives, such as non-selective solvents and (A-B) diblock copolymers, and will give an interpretation with the corresponding crossover theories. General conclusions are that the effects from thermal composition fluctuations have to be more seriously considered in polymer blends and that the more sophisticated crossover theories are needed for a precise determination of the Flory--Huggins interaction parameter and the phase boundaries. In addition, we discuss observations of crossover to other universality classes such as the 3D-Ising case, namely the transition to the renormalized Ising case when the composition of a third component starts to fluctuate and to the isotropic Lifshitz critical behavior when an (A-B) diblock copolymer is added.